When I told my dad that I visited Jeju Island, he told me about his first visit to the island. I knew that he went there on his honeymoon with my mom when they were in their 20’s. And I knew that more recently he attended a high school reunion there. He even stayed in the same hotel that I did! But I never knew about his first trip there as a teenager. It was part of a larger solo trip around South Korea. I asked him if this was something that many kids did at that time, like a rite of passage. But he told me, as far as he knew, he was the only one that he knew of. Here’s his story in the form of an interview. So I imagine that Jeju was not the highly developed resort island that it is now. No, there were no resorts then. It was 1961. Korea was a war-torn nation, just 8 years after the civil war. We were one of the poorest nations in the world. What did people make back then? The Korean GNP per capita was about $120 then. Countries like Vietnam and the Philippines had triple that. Even North Korea was at $350. Now Korea ranks as the 13th largest economy in the world. It really is a miracle. It’s hard to imagine what it was like. I guess people didn’t take vacations much then. When I was growing up, it was still a poverty-stricken, wartime atmosphere, even though there was a cease-fire. I know all the men still have to serve a few years in the military. Was it more militarized back then? Oh yeah. All the high schools of the nation were organized as military units. Our school numbered around 3,000 students, or about the size of an army regiment and it was organized as such. I was the regiment commander my senior year, in 1962. I was seventeen years old. I see. Then being a commander probably gave you some confidence to travel around on your own. Well, I traveled around the year before that. But I had a 2nd degree black belt in judo. That helps. But still, you were only a teenager. I traveled alone to Jeju when I was sixteen, a high school junior. It was no-money travel. You mean, you didn’t have any money on that trip!? Then how did you get all the way down to Jeju? First, I snuck onto a train from Seoul to Busan [a major port city on the southern coast]. I stayed at my aunt’s house for a few days there. Then, I stowed away onto a boat to Jeju from Busan. From the Jeju port, I walked east to Segue-po, then crossed over Mt Halla to Cheju city. Did you sneak onto buses too? No, I mostly walked. It took me seven days to walk around the island and another two days to hike up Mt Halla. I mostly slept in town halls, begging for free food, and sometimes I snuck onto public transportation. How was that hike up to Mt Halla. I didn’t have a chance to get up there. On Mt Halla, I was almost frozen dead since I didn’t realize the weather was drastically different than the hot and humid lowlands. There was ice at the top of the mountain. I was lucky to come across a hiking group. They were employees of the city bank in Cheju. They lent me blankets and gave me food. Wow, bankers saved your life on the mountain. How did you survive traveling around the coast? I traveled around cities and villages on the west side of the Island from there. It was the middle of a hot summer. There were a lot farmers working in the fields. I remember it was harvest season for green onions and potatoes. I helped them in exchange for food. But I hardly remember the Jeju food. You must have eaten abalone and pork. I couldn’t get away from them. That’s true. I had never eaten pork until I came to Jeju. The Jeju pork was so delicious, enough to change my food tastes. Since it was summer, was it easy to find places to sleep? I was sometimes able to find a place to sleep if I was lucky. The city halls or community halls were good places to sleep. The officers were kind enough to let me stay overnight, and they even shared some of their meals. They looked kindly on a high school student from Seoul, where most of them had never been, but wanted to go some day. It sounds like being able to talk to the locals was no problem. Actually, I could barely communicate with Jeju native people since their dialect was very far from standard Korean. However, there was always someone who was able to speak standard Korean. They were mostly veterans who learned standard Korean while in military service. What an amazing adventure. How do you think that trip shaped who you are today? 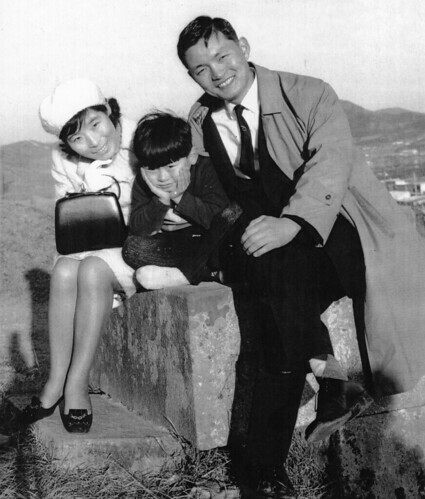 The photo is of my parent’s honeymoon in Jeju. The boy in the middle is a relative, not me. I don’t know why the picture came out streaky on flickr, but I can’t get rid of it. Oh well. Thank you for sharing this story. What an adventure! yup, pop is the coolest.